Despite hints of turmoil in the global markets, low volatility in the crypto market is persisting. 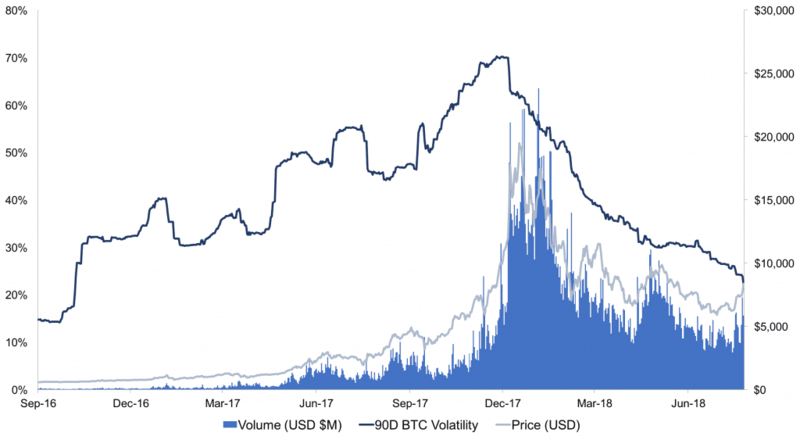 Increasing volatility and volumes fueled the last bull cycle throughout 2017, with decreasing volatility and volumes accompanying bitcoin’s weakening price throughout this year. Over the past couple of months, the realised volatility of bitcoin has fallen to the lowest level since the start of 2017. Unfortunately, an environment of low volatility and high correlations amongst crypto-assets is not much fun for the crypto-trader or the long-term investor. Increased volatility and the decoupling of cross-correlations would signal a return to health for the crypto markets. Such charts confirm that we are firmly in bear market territory and have been for the past few months. Many are calling on some type of trigger to pull us out of this bear market. Some have their sights on the approval of a bitcoin ETF- an event that would cause significant demand for bitcoin. Or perhaps the occurrence of a global macro crisis where bitcoin could act as a flight-to-safety asset in a risk-off environment. However, a singular event is unlikely to trigger a genuine shifting of the tides. It has been noted that bitcoin is highly reflexive; meaning that price becomes a fundamental driver in its own right. In this light, it’s likely that this year’s downward price trend is simply a natural market flush out- a price correction that is part of a larger peak/trough cycle observable throughout bitcoin’s history. Bitmex research recently delved into these cycles. 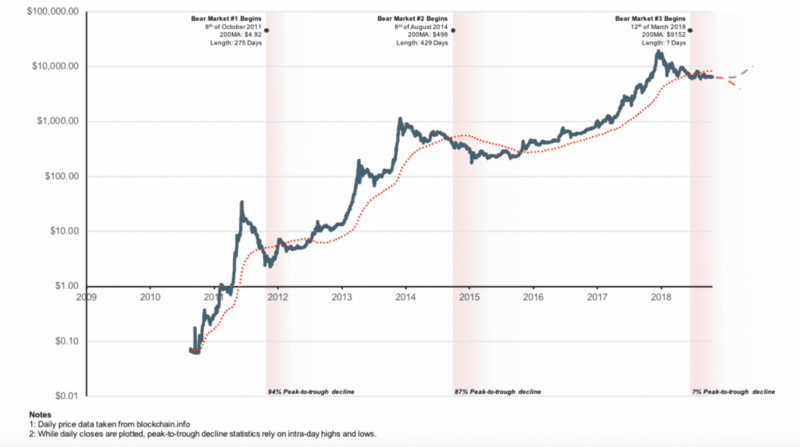 They define a bear market as when the 200-day moving average is above the spot price of bitcoin. By this definition, we entered this most recent bear market on March 12th for a total of 233 days thus far, where bitcoin has experienced a drawdown of 68% at current prices. Using this framework, past cycles would indicate that bitcoin still has 50-200 days of flushing out a further 50%+ from today’s prices before the next bull cycle kicks in. This puts us at a low at some point throughout 2019 but it could very well stretch out longer. Alongside the technicals, fundamental indicators show that the market may still be overheated. As I’ve mentioned before, the NVT Ratio is still very high, suggesting that we need more on-chain transactional activity to justify current prices, or the bitcoin price to drop to reconcile the difference. The good news is that the long-term prospects for bitcoin and the wider crypto ecosystem remain more positive than ever. Many developments of late are supporting an increasingly strengthened ecosystem. The most undeniable development has been the institutional support that continues to rally around crypto. University endowments investing in crypto funds, institutional-facing crypto service providers reporting healthy profits, multiple ETF applications submitted and the funding of institutional-facing infrastructure, are just a handful of the recent headlines around institutional momentum. Although the mid-term technicals indicate sideways chop and further consolidation, the long-term future of crypto remains very bright indeed. Callaghan Innovation’s investment in MyCryptoSaver, which has just rebranded to Vimba, has drawn criticism. Binance’s launch in Uganda shows large crypto appetite among the unbanked. Sia ($SIA) completes hard fork to brick ASIC miners. Digital asset manager, Grayscale, reported record institutional inflows into their investment vehicles this quarter and healthy profits for the year. According to CryptoFundResearch, crypto funds have approximately (USD) $7.1B AUM (assets under management). Recent market turmoil has global traders speculating that a shift from a risk-on to a risk-off environment may be on the horizon. See last month’s Rehashed for potential implications for the crypto-markets. As always, thanks for joining - see you next week for Rehashed. 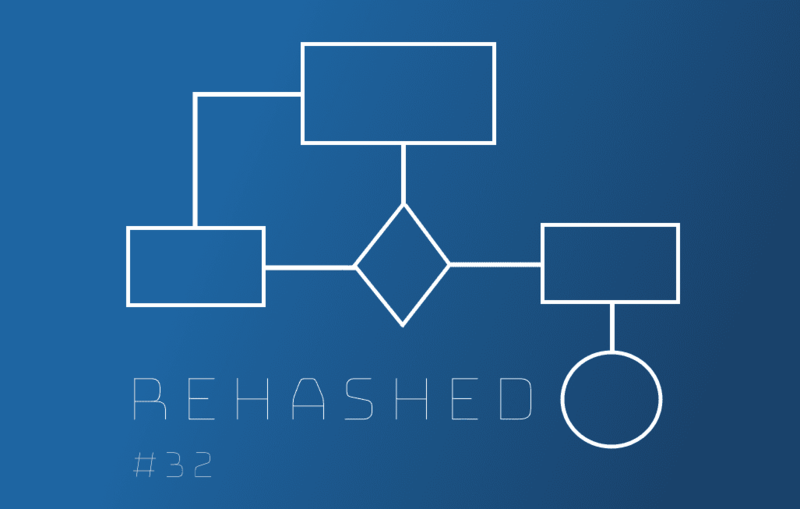 View next issue: Rehashed #33 Forking: Feature or Bug? Capital markets to crypto convert. From Christchurch → Boston → New York, Freddie became intrigued by the potential of the digital asset economy after plucking a book on Bitcoin off a New York library bookshelf in 2016. Her parents are thrilled that she is chasing magic money on the internet. Disclaimer: The above references an opinion and is for informational purposes only. The opinions expressed by the author do not represent the opinion of BitPrime.